I am interested in the throttle body. Will this work on a 07 Shelby GT500? It already sold, sorry man. If you still have the wideband I will take it. My name is Shawn and my number is 315 430 5203. Interested in the cold air kit. PM me with picks. Jlt CAI, very interested, would you take $275 for it? Have you ever figured out what that ticking noise was ?!?!? Ya it will big a good long time before I have anything to show you up with unless we go from a standing start. Even then that will will only be for a few feet, all wheel drive has its advantages, plus the fact this engine makes power across a huge range. Still I wont be doing much more than boltons till about 10k miles figure the engine will be pretty sound by then. This is the first american car ive had in 15 years aside from a shitbox Saturn to drive to the airport and back, so im still a little leerly of the quality, last american car was a 97 dodge avenger that went through 4trannys and ripped the right shock tower from the frame. Well thanks again for the fun. Do they still have open drag days at firebird or whatever the hell its called now? Hey Buddy, That was fun playing on the US60 on Tuesday night. Very one sided, and after looking at your profile I can see why. I was in the Silver Flex that cruised by at about 95 around Mesa that you felt like toying with :) You waited so long that I figured you just your not for a Sunday night drive. Well Maybe next time I'll be able to run a little harder, had my kids in back seat I try not to go into triple digits with them in the car. Hey man, I can't PM you for some reason. Did your brother get his car tuned by Rob Wetzel? I'm looking for someone to tweak the tune in my Cobra. 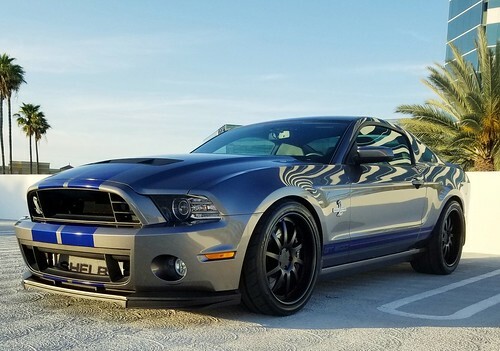 Lund tuned, VMP Gen3 TVS, JLT 123mm intake, FRPP twin 65mm T/B, VMP 2.6 upper, Gates green belt, Billet fore fuel rails, Kenne Bell 21 volt BAP, Kenne Bell BIGUN intercooler, Shelby C&R heat exchanger, twin Bob's oil separator, ARH 1 7/8s LTs, OFR H pipe, SVE axle back, Batron Shifter, Stainless steel brake and clutch line, Shelby Super Snake wheels, Shelby Super Snake gauges, DBA 4000 T3 front rotors, Griggs racing spider watts link, Griggs racing single adjustable lower control arm, Griggs racing lower control arm relocation brackets, H&R sport springs, true forged matte black hood vent, JLT painted radiator cover. Redline hood struts.